Revision is not something that comes naturally to me. I had written four manuscripts before I finally cracked what it means to really revise a novel, rather than check for typos and move a few scenes around. It took me years to figure out how to get down to the bones of my story, identify weak spots, incorporate CP feedback, and figure out how to strengthen the parts of my story structure that were failing. For a long time I'd draft a book, mess around with it for awhile, and then hit this point where I knew there was still stuff wrong with it because it wasn't getting agent interest, but I couldn't figure out how to fix it. If any of the above describes you, dear writer, take heart! Over the next little while, I'm going to do a series of blog posts breaking down how I revise, going in-depth on each point. 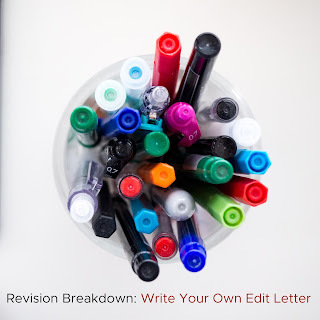 Every author has their own revision process, and mine may not be yours—but hopefully these posts will provide a jumping-off point to give you a better feel for what a revision process can look like. Today's post deals with my very first revision step: I write my own edit letter. For a lot of people, the first step in revision is to print or upload a complete draft of their story and then read it and make notes. I will be up-front and say that while this used to be my first step always, it's not anymore. 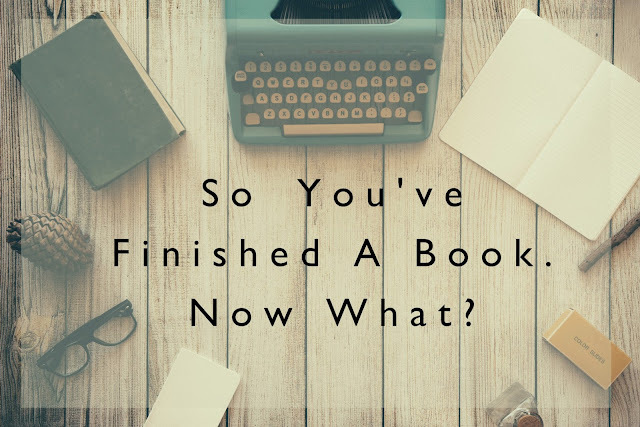 I've learned that a) I have a finite number of times I can read my book in rapid succession without losing my ability to spot problems, and b) I'm not very good at picking up on the big-picture structural changes my book needs when I'm reading through it. On a read-through, I have a tendency to get hung up on smaller things, and miss the crucial big-picture ones. Therefore, while there are definitely rounds of revision that start with me reading my book through cover to cover, I tend to use them both randomly and judiciously. If I have recently read it, or otherwise feel like I'm doing a decent job of holding the story in my head, or feel like a read-through would be more valuable after I've applied the changes, then I hold off. My true first step—really a pre-revision step—is that I almost always let my book sit for awhile and send it to CPs before I dive into revision. 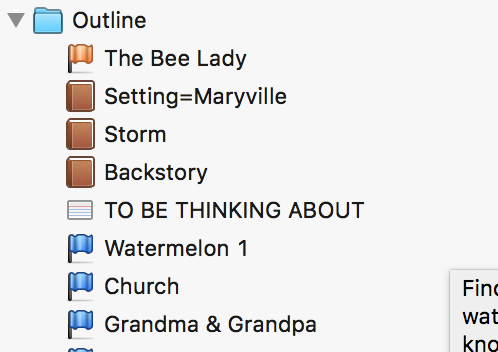 The exception is when I've made big changes to the plot while drafting and the draft wouldn't even make sense to a CP; for instance, with Where the Watermelons Grow, I was 3/4 through drafting before I decided I was bored of writing a straight contemporary story and wanted to add magic bees. 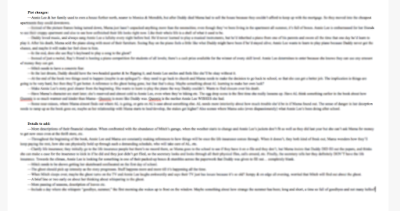 Because the plot changed dramatically at that 3/4 point, I went back through and added the magical element from the beginning before I sent it off to critique partners. But after I've finished drafting, let the book rest a little, and gotten feedback from CPs, my agent, or my editor (depending on which round of revision I'm on), my first step is always writing myself an edit letter. Once you have an agent or an editor (often, even once you've got some good CPs), you will start receiving edit letters to help guide your revisions. Most agents and editors don't use Track Changes or other in-text comments to give feedback on big-picture issues that need to be changed; instead, they write an edit letter, a paragraph-by-paragraph breakdown of the things they feel need to be changed or strengthened as you revise. I get easily overwhelmed by the revision process and always need to spend a few days making a solid revision plan before I dive in; I'm totally not capable of holding everything in my head. As such, the first thing I do is write myself what essentially amounts to an edit letter—to myself, from myself. It's usually not as in-depth as edit letters I get from my agent, editor, or CPs, because I can use shorthand and still know what I mean later on. But it's essential for me to have a to-do list before I start revising, especially if I'm trying to collate feedback from multiple CPs, or if I've had ideas I want to change in addition to what my agent or editor asked for, or if my agent or editor pointed out a weakness in my story and I then brainstormed a new way to solve it. I begin by combing through all the feedback I've received so far and writing it down, along with any ideas I've had independently. 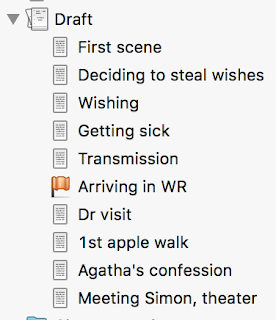 Sometimes this looks like a checklist; sometimes it looks more like a paragraph-by-paragraph freewrite of my story's problems. Unless it's a very, very light line edit, I usually will organize the revision items by size—big changes (changes that affect whole story threads, whole characters, or the structure of the plot itself) and small changes (things that generally only affect one scene, or require only a line or two of difference throughout the book). If I have a lot of items on my list, I'll even split them into big, medium, and small. Starting like this lets me organize my thoughts, collate feedback from different sources, and keep track of what I've done and what I have yet to do, since I will usually "check off" items on my list (usually by italicizing them) as I go. It also lets me draw attention to thinks I think I might forget, or things that will take a lot of work or finesse; these I usually bold. Mostly, starting like this helps me to work up the courage to dive into the revision pool—something that's always really intimidating to me when I'm preparing to start a big revision! 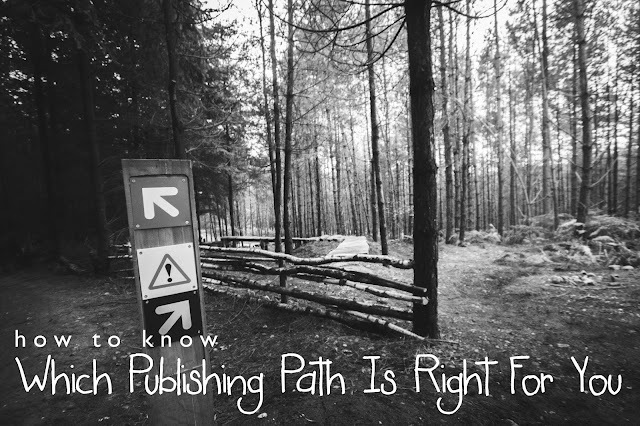 In my next post, I'll discuss mapping my book to figure out where the weak spots lie! 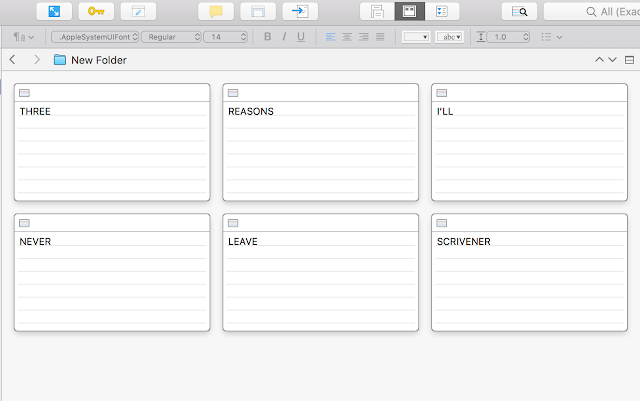 Like a lot of writers, I spent years hearing about the mythical, magical beast that is the writing program Scrivener. When I finally took the plunge and bought it on sale a few years back, I was simultaneously overwhelmed and underwhelmed. There was so much to learn! And it seemed really complicated! And it didn't jump out to me as being something that was going to especially help my writing! Was it really WORTH it, I wondered, sneaking back over to my precious Word documents? Since then, though, I've become a diehard Scrivener convert. The moments when I have to go back to working in Word are painful. There are a lot of fancier functions on Scrivener that I skip completely because they are, for me, unnecessary or distracting—but the basic ones that I do use are transformative for me. Really truly, to navigate Scrivener to the extent that I do you basically need about 10 minutes of video tutorials and a few more minutes to play around. That's it. 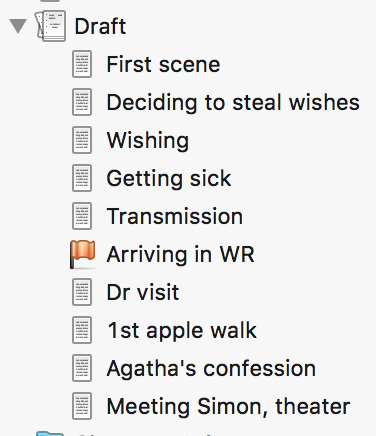 Also, I started out using the "novel" format when I opened new documents, but that honestly introduces WAY more clutter than I ever actually use. I usually select "blank" when I create a new document these days. 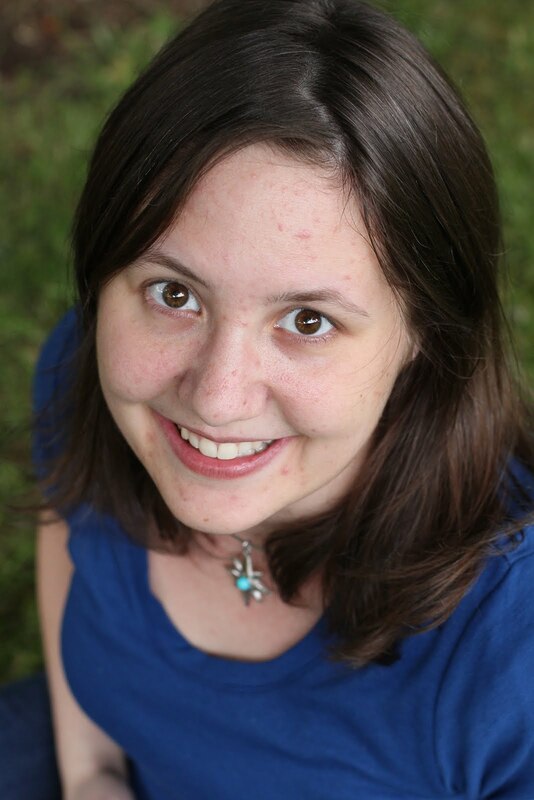 Want to know how I use Scrivener and why I love it so much? Here you go! This is really easy to do in Scrivener. You use the green "plus" button in the top left corner and long press it; it will give you the option to add a new page, a new folder, or import a web page. As a general rule, I use pages for small things like queries and such, and folders for drafts, research, and outline—anywhere that I want to collect multiple subpages into one area. 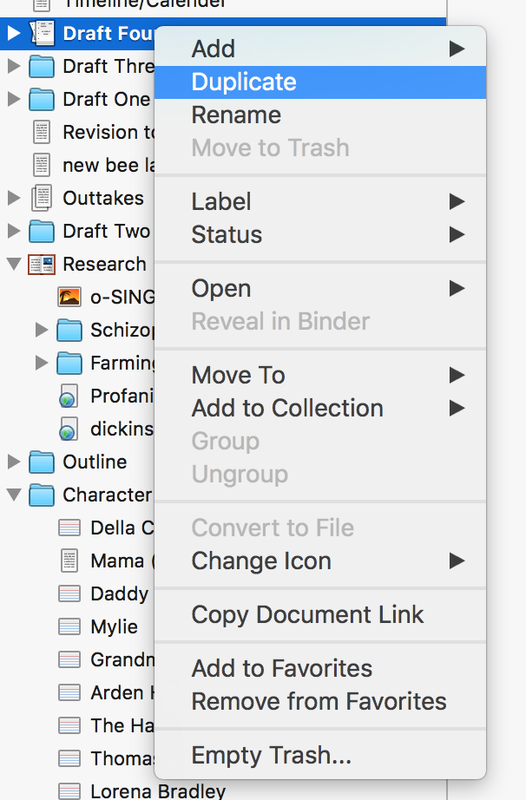 Scrivener automatically has a special type of folder included for your draft—it looks like multiple pages together, instead of like the blue folder. I usually use that for whatever my active draft is. 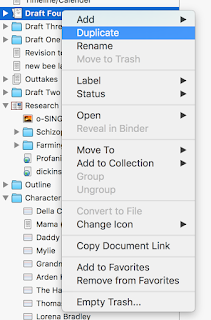 When it's time to revise and I need a new draft, I right-click that and hit "duplicate," then use the special folder type for my current draft. It doesn't make any difference that I can tell, it just looks different so I can always tell which draft I should make changes to. 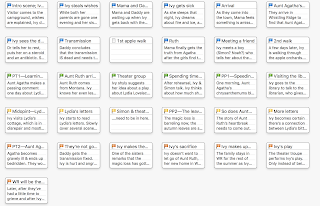 In a perfect world, I'd be using the corkboard feature in the way that it was intended, the way it's shown in how-to videos—to give a brief overview of what was in each chapter so that I could see the outline of my in-process book as I drafted or revised. Honestly, though, I've never found that that helpful. 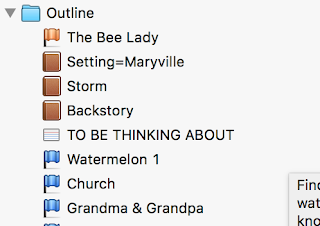 Instead, I typically start a new folder in my sidebar, completely separate from my draft document, and call it "outline." 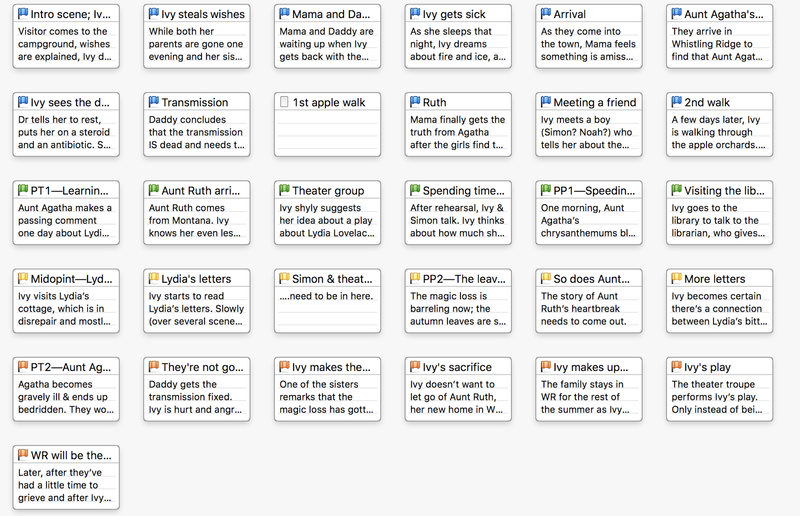 and use subpages in that folder to make "notecards" for my outlining method. If you highlight the folder itself and not the subpages—like I have in the screenshot above—they show up as notecards in corkboard view. And there you go! That's why I'm a diehard Scrivener user, even when much of the program's more complex functions I don't find particularly helpful. Also, software tutorials are NOT my strong suit, so I apologize if any of this has been confusing! I've found that Google is a wealth of Scrivener know-how, though, and that simple searches can turn up the answers to basically anything you need. 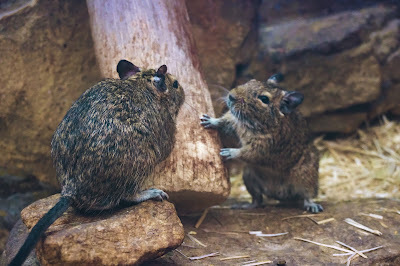 *technically these are degu. But whatever. Pretty close. Guys, I'm feeling particularly awesome today. Let me set the scene: A rustic home in the picturesque foothills of Oregon's Mount Hood. A mother and her four-year-old daughter tagging along with their extended family on a quick two-day jaunt for spring break. A very, very sleepy mother, who has been woken up twice in the night already to take her daughter, whose pull-ups she forgot, to the bathroom. The clock strikes 6:50. The groggy mother is awoken by the daughter—who has been sleeping in a nest of blankets and pillows on the floor—standing beside her bed. "Mommy!" the daughter says. "There is something CRAWLING UNDER THE BED! I think it is a very big spider or ant!" It is a mouse. A little brown mouse, scurrying frantically from one side to the other. "A MOUSE!" The daughter exclaims in delighted surprise. "I never saw a MOUSE inside a HOUSE! It is so CUTE!" The mother things, if we have to set up a mousetrap for this little dude, she is going to be scarred for life. Thinking fast, she dashes into the kitchen and finds a cereal bowl. "Okay," she says when she's squeezed herself back into the bedroom and closed the door, through which the mouse has already tried and failed to escape. "We're going to trap it with this bowl. And then we'll figure out what to do with it." "We will take it back to its friends and family!" the daughter declares. "It will miss its friends and family!" Thence follows an exciting twenty minutes of chasing the mouse from one side of the room to another. Each time the mother gets close, the mouse darts back under the queen-sized bed and out of reach. The mother fruitlessly searches for peanut butter in the kitchen, finding none. "I just want to warn you," she says carefully to the daughter, "that if we can't catch it this way, we might have to use a mousetrap, and the mouse will probably die." —with reflexes like lightning, the mother traps the mouse under the cereal bowl. It takes her a few minutes to figure out what to do now that she's got the mouse immobilized under the cereal bowl. Heavy paper would work, but she's pretty sure that none exists in this simply-outfitted vacation home. Finally she remembers that she brought a paperback picture book to read to her daughter at night, and instructs the daughter to retrieve it from the shelf it's on. Ever so carefully, she slips the book behind the bowl, and—the mouse remains trapped. "Now we can take it back to its friends and family!" the daughter cries. "But... do you know where its friends and family are?" "I'm pretty sure," says the mother as she puts on her boots, "that they live in the trees on the other side of the street." End Scene on a shot of the mother feeling sleepy but victorious, and seriously contemplating rechristening herself The Great Cindy, Valiant In The Face Of Speedy Rodents. This post has been bubbling around in my consciousness for months now. More than once, I've thought about writing it and then stopped myself. No, I've thought. I don't want to make people feel bad. I don't want to burn bridges. I don't want to deal with responses telling me that the way I'm feeling isn't valid. I don't have the oomph to listen to people tell me I'm wrong. I just don't have the energy. But you know what? It's been months, and the grease-fire that is the healthcare debate in our country is just getting worse and worse. Today, the most hardline conservative members of the House of Representatives convinced the White House to strip even more protections out of an already-terrible healthcare reform bill, and they're after even more—including the piece of the law that bans insurance companies from charging more to people with chronic or genetic illnesses. Like, you know, me. And I am left with this burning desire to share these feelings, to speak plain words, to do whatever I can to give people a peek into what it feels like to be a chronically ill, disabled adult with close to half a million dollars a year in medical bills right now. And I'm posting it on my public-facing blog, because this is real. It is important. And I am done being silent about it. I will not speak eloquently. My words will not be beautiful. They will probably be angry, and they will definitely be stark. And maybe they will make you mad. If that's the case, I'm sorry—except not that sorry, because maybe that anger will also give you understanding, offer a glimpse into the anger and fear and hurt and grief that I've been feeling these last months. Because there has been so much of all of that. So much that some days I feel like I can't function. So much that some days I sit on the couch trying to disengage from news headlines while I hide furtive tears from my daughter. So much that when I gather my nice words to post educational items about healthcare on Facebook, it feels like a Herculean effort, because all I want to do is cry and scream and rage against the world. On November 8th, 2016, you start crying as election results come in and you do not stop for days. You cry in your sleep, which you didn't know was possible. You cry and you cry and you cry and you think, how could people that I know and love care for me so little as to vote in a man who has made it his life work to undo the laws that are the only reason I have healthcare right now? In the months that follow, you have lots of days where you don't even want to go out in public, don't want to go to church, don't want to run into anybody you know, because if they ask you how you're doing you know that they don't want to hear that you're having an existential crisis over how calmly everybody is debating what your life is or isn't worth. You have always loved your country. Independence Day is your favorite holiday. But lately, you find yourself hating living here with a passion, fantasizing about moving abroad—and not even because of the superior healthcare, but because you aren't sure you can take another day of living in a country in which people spend their days saying things like Why should I have to pay for somebody who's sick? and you know, even if they don't, that the subtext of that is Why should I care if sick people die? You get angry sometimes, when friends gush about your adorable child. You want to take them by the shoulders and shake them and shout DON'T YOU UNDERSTAND? DON'T YOU UNDERSTAND THAT THIS CHILD, THIS BEAUTIFUL GIRL WHO DANCES IN SUNLIGHT, IS EXACTLY WHAT'S AT STAKE? Don't you understand that I am fighting so that she can grow up with a mother, fighting so that I can live long enough to hold her own babies someday, as slim as that possibility might be? You have had setbacks in your access to insurance in the past, but never before have you genuinely thought, I could truly die because of this. But now that thought is in the back of your mind always, always, without ceasing. You tell your husband to freeze your retirement for awhile, not to buy a new car, not to do anything with your first payment from your debut novel. You spend your time thinking of contingency plan after contingency plan. You pray all day some days. And other days, you don't pray at all, because you know that sometimes God allows people to suffer and you can't even bear to think that maybe he could allow your sweet daughter to suffer without a mother. You cry typing these words. You cry and cry and cry. Rich men with nothing at stake debate your fate in Congress. Patronizing friends and family assure you that "it will all work out," that "they have a plan to take care of everyone," that "it won't be as bad as you think," that "you have to be positive." And you want to yell, I have ALWAYS been positive. I am an optimist. But these months have buried my optimism so deep I don't even know where it's hiding. People complain that their healthcare is expensive, and you think: Yeah. Healthcare IS expensive. Because for you, it has never not been expensive; there has almost never been a time at which you weren't paying at least 10% of your income in medical expenses. People say I can't afford to use the health insurance I pay for, and you think: Good for you. It's lucky that you have that choice. Because no matter how high your deductible has been in the past, you have always had to meet it, because it was between expense and death. Because, in the end, you'd rather be broke than dead. And through it all—through all the conversations and the headlines and the long, long nights of fear, you are never allowed to forget just how little your country values bodies like yours, just how little most people genuinely care. Sure, they might care about you, objectively, because you're related or because you write funny Facebook posts or because you have interesting conversations. But as a whole, your fellow Americans care only for bodies that are whole and strong and healthy. People talk about "making wise choices" and "saving for healthcare when you need it" and "taking care of your health so you don't need interventions" and you want to rage, scream, throw things, shout about how sometimes you're not lucky enough to be born with genes that work, and sometimes you cost half a million dollars a year in medical care for conditions that are interwoven with your DNA. You think about all the tiny aggressions you've dealt with in your life—the people who snapped at you for using a disabled placard, or the professors who tried to flunk you because you missed all those classes due to repeated hospitalizations, or all the many, many people who simply haven't understood the reality of your limited, liminal life. And you think about how you always assumed that these were the outliers, the fringe wackos who lacked compassion, the few and far between. And about how you were clearly wrong. Because now, those who lack compassion are not at the fringe. They are everywhere. They are controlling your government. They are making passionless decisions about whether a body like yours has any value at all. And you are not sure you have ever felt so alone. Over the weekend, my college-age brother had a rousing discussion on his Facebook page responding to the question "is Harry Potter 'great literature?'" The bulk of the questions were from his fellow college students, dryly opining about how Harry Potter couldn't possibly be considered great literature because it wasn't as "intellectually stimulating" as Shakespeare. Needless to say, after 24 hours of reading those posts, my little kidlit-writing, Harry-Potter-loving self was getting kind of steamed. Yesterday afternoon Mahon took Kate to run a bunch of errands. Background info: I've been sick, really sick, for two weeks, and done almost nothing but lay on the couch in that time. 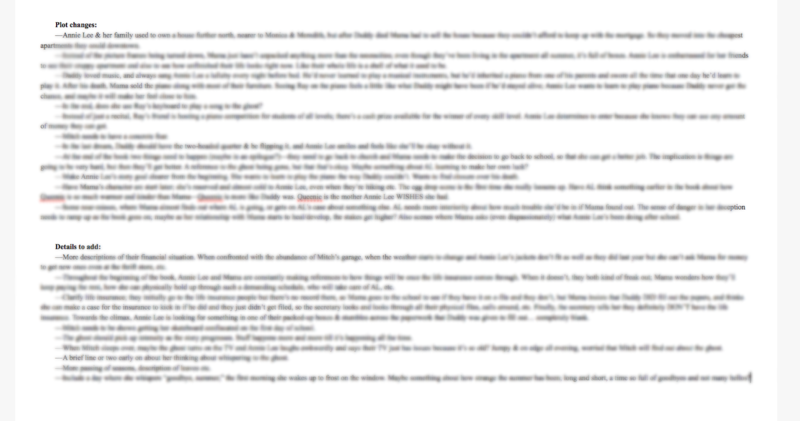 So the combination of sick + alone + stir-crazy and bored led to something that could be interpreted as foolish: I spent twenty minutes writing an 1100-word manifesto in response to that Facebook thread on why I'm willing to bet that Harry Potter will, in time, be remembered as a classic. 1) You cannot compare Harry Potter to Shakespeare or even to Robert Jordan or Brandon Sanderson. Those are ALL DIFFERENT CATEGORIES. Harry Potter is children's fiction; the others are all adult (and one is adult stage plays which is completely different also). 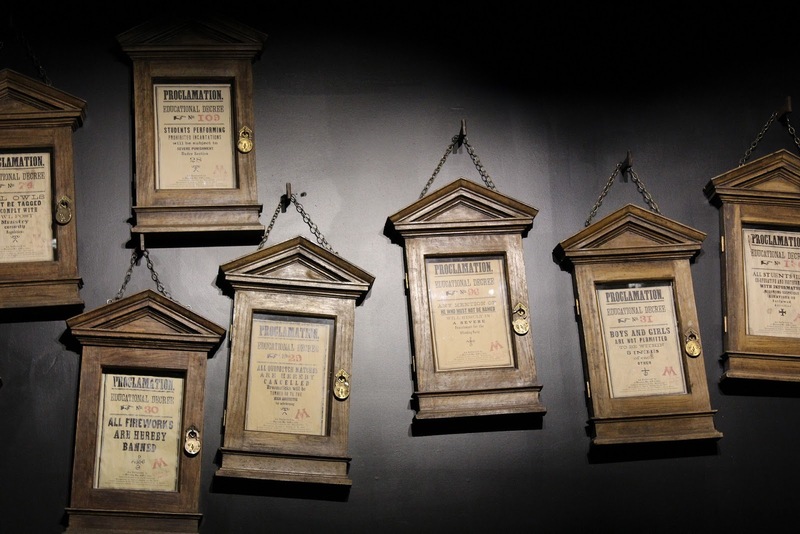 The only sorts of classics to which you could reasonably compare Harry Potter would be things like ALICE IN WONDERLAND or THE CHRONICLES OF NARNIA; both considered classics just as much as THE SCARLET LETTER is considered a classic. Trying to be like "Harry Potter is no Bronte!" is like saying "Man, my sock really doesn't make a very tasty sandwich." Children's literature has different rules, goals, and things that make it great than adult fiction does. End of story. Even adult genre fiction (Sanderson, Jordan) are very different than children's genre fiction. 2) Classic literature wasn't "classic" when it was being published. In fact, most of the greats we read in English classes today were the pulp popular fiction of their day. Jane Austen? Read far and wide by people who were slightly embarrassed to admit they were reading books about a woman instead of "important literature." Shakespeare? Many of his contemporaries scorned him as an intellectual lightweight who just pandered to popular opinion. (And they thought that the things we recognize today as innovative were just stupid.) The ones who weren't in this category were, by and large, overlooked. In other words... people said the same things about most of our "classics" that people say today about Harry Potter. 3) JK Rowling is no slouch. Her "single mom rags to riches" image—which, by the way, is part of book marketing; people are more likely to read something by somebody with a fantastic Cinderella story than by a savvy classical scholar—aside, she was an extremely well-educated woman who'd been practicing writing for awhile when she finally got her big break. (On average in creative industries it takes, like, a decade to become "an overnight success.") The symbolism and classical scholarship in her books goes MILES deep. Few modern children's authors have such a subtle and masterful grasp on using symbolism and fine-detail-work as Rowling does. People rag on them for being long, but there are pretty much no wasted details in the series: think about how many "huh?" moments there were in the movies when they removed a bunch of the smaller, "unimportant" moments from the book. For an example of the kind of mind-blowing meanings hidden in microscopic details that I'm talking about, check out this link, which got shared during the Facebook conversation. Also, few authors in any genre have as good a handle on long-form series; think of how many trilogies kind of fizzle out before they even get to the end, and yet Rowling managed to craft a behemoth of a series without a lot of dull, lagging spots, and with each book having its own strong story arc while playing perfectly to the arc of the series as a whole. The themes in Harry Potter are also incredibly deep as well—layers and layers of different themes that touch on some of the biggest questions literature can touch on (death, afterlife, loss, handling grief gracefully, friendship, imperfect people in positions of authority, the frailty of the wisest, prejudice, classism/racism, the supernal nature of good vs evil, etc). So I'd argue that Rowling did do a lot structurally that was meaningful—done in both a way, and to a degree, that most writers have not been able to pull off. 4) At the end of the day, people hate on both genre literature (ie, fantasy) and children's literature ALL THE TIME. In the children's lit world, we sit around and vent to each other about the incredibly rude things people say to us (like, "Oh, that's nice—do you think you'll ever write a REAL novel? "), because it's such a prevalent attitude in society. But make no mistake: just because a children's novel is more accessible and quicker to read than an adult novel doesn't mean that it's automatically less-than. There's a reason that children's novels tend to be the ones that many adults remember and speak of most vividly, and it isn't (as much as we English majors might sometimes like to think it is) because the general population is too stupid to comprehend HEART OF DARKNESS. It's because children's literature is a profound part of what shapes us and makes us who we are. Good children's books inform our opinions, our empathies, our deep thoughts. Good children's books are also universal in nature, tapping into deep themes and emotions from people all across the age spectrum, which is why adults often still gravitate towards YA and children's fiction plenty of the time. Just because something is written for children doesn't make it either childish or Not An Important Book. Likewise with genre fiction; just because something involves magic, or a funny best friend, or dragons, doesn't mean it can't also contain deep and important reflections on the human condition. 5) Even if all the above were not true... things can be great literature even if they're not replete with deep symbolism and statements on the nature of mankind. There are plenty of books that are considered classics today that are classic just because the author was very witty, or because she was terrific at creating characters, or because it was the kind of book that people just genuinely enjoyed reading. And particularly in children's fiction, great literature can take all forms; what makes it great is the two-pronged effect of resonance and endurance—i.e., how much it resonates with people, makes them question what they've believed or come to know themselves or the world better, and also whether it's a "passing fad" kind of book or a "stands the test of time" one. There are certain books that have had almost as much popularity as HP which I'm willing to bet won't be remembered as classics, because they lacked one or both of those elements. But, by the same token, I'm willing to bet that Harry Potter will be one that endures, in the vein of Lewis Carrol or C. S. Lewis or any other classic children's literature. 6) Things also don't have to be Great Literature to be worthwhile (though, as I said at length in my overly wordy essay above, I think HP falls into that category). Particularly with kidlit, not all books are going to have that resonance or endurance, and that's OK; at the end of the day, the sacred responsibility of children's literature is creating readers. 7) In the English literature world, we sometimes fall into this false dichotomy—assuming that something cannot be both enjoyable and meaningful, that if we're not working rigorously to access a piece of literature, then that means that it, in turn, is not rigorously challenging us. Likewise, we often have a false dichotomy about other things that are "good for us", like vegetables: our culture is filled with this idea that vegetables are something that we have to suffer through in order to grow strong. Personally, I don't know about you, but I think vegetables are divine. Properly cooked, a bowl of green beans or steamed broccoli stands up there with dessert, as far as I'm concerned. The idea that healthy foods can't also taste good is patently false, and I think the same holds true for the idea that Meaningful Works of Literature can't also be accessible, enjoyable, or fun. Quite often, the works of fiction that have the most wide-reaching and transformative effect are also the most exciting—the kinds of books that we want to dive into and stay in, while simultaneously having our worldview challenged and our empathy deepened. Something can be both fun and important, both delicious and healthy. It's not a zero-sum game, where only the Really Smart People can access Great Literature. In fact, I'd say that the truly greatest works of literature are the ones that draw regular people into them, inspiring them to engage with a book even if they're not really the "reading type," while subtly challenging their worldview, their sense of self, and forcing them to reevaluate and recommit to a meaningful life. Great literature does all of this while also masterfully using literary techniques and creating the kind of narrative that lingers with readers for the rest of their lives. By all these metrics? I'd say Harry Potter succeeds very well, indeed.